Last week Apple released iOS 6. Along with the usual bevy of new features and refinements, the company made one change that’s drawn some ire. The built-in Maps app ditched Google as its data source, instead relying on information from Apple’s own servers. Apple has doubtless been preparing for the change for years, but that didn’t mean the transition was smooth. In fact, it was anything but. I can attest to that from first-hand experience. I managed to snag one of the last iPhone 5s in Cambridge last Friday. To be sure, it’s a gorgeous device—for some reason the tall screen combined with its thin profile make me feel like I’m holding an artifact of the future. But that also meant I was forced to run iOS 6 and use Apple’s own maps.¹ The software behind the new Maps app is slicker and snappier than before, as I predicted a few months ago, but no one ever doubted that Apple could write some killer software. The concern was over the data. Could Apple build a GIS as complex and detailed as Google in just a few years? In short, no. But for all the inconvenience this will bring in the short-term, I still think Apple’s move away from Google was the right move. For everyone involved, users included. The importance of Apple’s Maps isn’t that it snubs a competitor or that it now provides turn-by-turn directions. No, Apple’s in-house solution is significant because it serves as a cartographic foil to Google’s Maps. 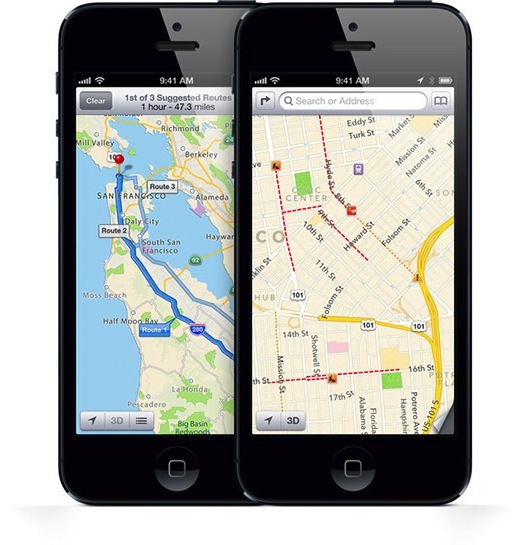 Compared with the Google Maps of today, Apple’s shortcomings are obvious. The lack of transit directions is problematic,² many addresses are misplaced, and its routing algorithms need some tweaking. As a 1.0, though, Apple’s Maps compares favorably with Google Maps circa 2005. Back then, there was no street view, no hybrid view, no API for developers. But it’s not 2005, it’s 2012. If Google’s excellent maps had never existed, we’d be heralding our new cartographic savior. But years ago Google showed us how useful good maps can be. We’ve already seen the light. And we love it. Google’s interface is slick and responsive. Their experience in search means queries return useful results more often than not. The company has spent years polishing its maps, adding insane amounts of detail, revealing secrets even we didn’t know about our own neighborhoods. As a result, Google Maps has become the de facto source for web maps. But that dominance poses a problem. Too often, we assume that maps are pictographic snapshots of the world around us. But we forget that they paraphrase the real world. Maps abridge things here, gloss over details there, and otherwise simplify the world. Someone has to decide what gets left out. Whether it’s one person or an entire company making those decisions, the potential for manipulation—intended or not—is high. Everyone has their own biases, and Google’s is advertising. As a result, businesses can pay to alter the map. It’s a subtle reminder that maps aren’t purely factual—they’re facts filtered through a worldview. That’s not to say Apple’s cartographers and programmers don’t have their own biases. But the added competition will keep Apple, Google, and others more honest. For now, it’s Apple that needs to catch up; their maps are clearly lacking. Yet there may be a time when Apple’s maps exceed Google’s in quality, forcing the search giant to reconsider how it gathers and displays information, including ads. There will never be a map that everyone considers 100 percent correct, but the more competition, the closer we’ll get. In the long run, that benefits everyone.